We have designed warehouses for distribution centres up to 11,000 m2 in area for department stores and supermarkets for both dry and chilled goods. These include high bay and narrow aisle warehouses with joint free super flat floors. 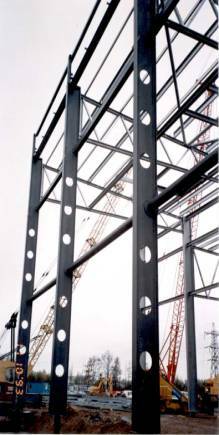 The requirement for a suspended ground floor would have meant that the high tolerance floor would have been constructed in the open before the erection of the frame. To avoid this, the frame was erected directly from steel stubs cast into the piles to enable the edge beams and high tolerance floors to be constructed under the cover of the roof enclosure. This shortened the construction programme by 8 weeks. 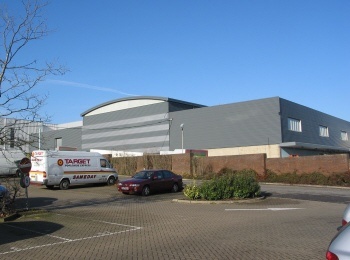 A dry goods warehouse, built in two phases giving a floor area of 18,000 m2. The client's main requirements were column free spaces and a low maintenance joint free floor. This was achieved by 47.5m span portal frames and post tensioning the floor to give a joint free surface which will not break down under the relentless traffic from fork lift trucks. 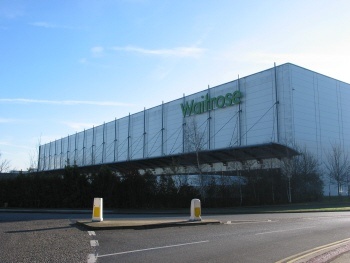 This high bay warehouse with automatic picking system was no longer suitable for Waitrose as the range of goods they supply increased. We designed the foundations for the high bay warehouse in 1968 but by 2000 it was no longer used so in 2003 we demolished the high bay racking and converted the building into a two storey low rise warehouse whilst maintaining the operation of the surrounding warehouses.